Explain how to identify territory users by territory role. Use Chatter to collaborate on territory models. Report on the accounts and opportunities assigned to territories. Cloning lets you make a copy of a territory model that you can use to test territory characteristics. The new model includes the original’s territories, assignment rules, users, and manually assigned accounts. When cloning is complete, the new model is in Planning state. If you’re cloning a territory model with assignment rules, make sure that any picklist values referenced in the assignment rules are valid. 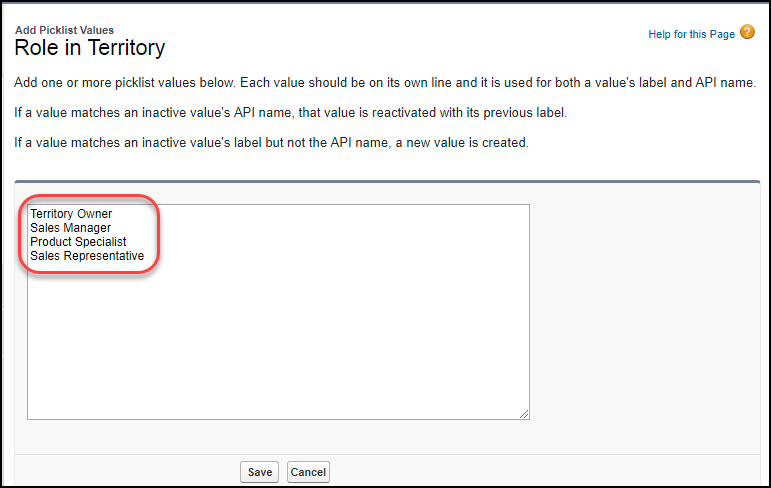 If you’ve deleted or replaced a picklist value that’s referenced in an assignment rule, the picklist value isn’t valid, and the cloning process fails. Maria wants to set up another territory model for testing purposes. She wants to base it on her Current Fiscal Year model. Here are the steps she takes. For the label, enter Test Model. For the description, enter Territory model for testing. Make sure the Territory Model Name is Test_Model. The model state changes to Cloning while Salesforce processes Maria’s request. Cloning can take some time, depending on the size and complexity of the model. When the process is complete, Maria gets an email to let her know. The next thing Maria tackles is assigning roles to territory users. Let’s find out what she’s doing. To track user functions within territories, you can create territory roles such as Territory Owner, Sales Manager, or Sales Representative, and assign them to territory users as needed. Users can even have different roles in different territories. 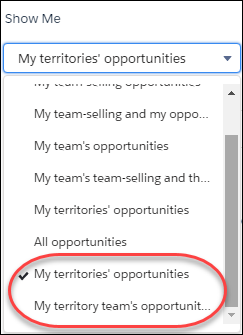 Add territory roles to the UserTerritoryAssociation object’s Role in Territory picklist so you can select roles for territory users. You can use the picklist you define for all territories in Active or Planning state. Here’s how Maria does it. Click your user profile icon in the upper-right corner, and then click Switch to Salesforce Classic. From Setup, in the Quick Find box, enter User Territory Associations, then select Fields under User Territory Associations. Click Role in Territory, and then click New. Maria enters the picklist values Lance wants her to include: Territory Owner, Sales Manager, Product Specialist, and Sales Representative. The values Maria entered are now available from the Role in Territory picklist on the territory’s Assigned Users edit page. Maria plans to assign a role in the next task. Now that Maria has created a Role in Territory picklist, she can specify the roles of users within territories. Here are the steps she takes to add the Territory Owner role for Lance Park in the Northern California territory. She can do this in Lightning Experience, so first she switches back to it. Click your user name in the upper-right corner, and then click Switch to Lightning Experience. Open the Northern California territory record. From the Role in Territory picklist, select Territory Owner. Great! Maria has assigned the Territory Owner role to Lance Park. Enable Chatter feed tracking for territory models to collaborate with your team on model development directly within model records. Your team can post and respond to comments, attach files, and get notifications when model states change or key fields are updated. After you enable and configure Chatter feed tracking, anyone with access to a territory model record can use Chatter to collaborate on that model. People who follow the record get updates in their own Chatter feeds when tracked fields are updated. Lance has asked Maria to enable collaboration via Chatter. Lance especially wants to track the State field in case it changes. Maria follows these steps. Select the Territory Model object. Select Enable Feed Tracking and State. Now the Chatter feed appears in Ursa Major’s territory model records. Maria lets everyone on the team who maintains territory models know that they can use Chatter to follow and collaborate on territory models. Isn’t working together fun? Create reports to show your reps which accounts and opportunities are assigned to the territories they cover. The My Territories filter shows accounts and opportunities that belong to the territories a rep is assigned to. The My Territory Team’s filter shows accounts and opportunities for territories a rep is assigned to and their descendant territories. Maria follows these steps to create territory reports for her team. On the Reports tab, click New Report. Choose an account or opportunity report type, and then click Continue. In the Show Me filter field, select My territories’ or My territory team’s as the filter criterion. Finish creating the report, and then save your changes. Maria’s team can also select My territories’ or My territory team’s when they run other account and opportunity reports. Maria accomplished a lot today. Lance and the rest of the Ursa Major sales team are totally pleased with the results. Here’s a review of what Maria did during both of this trail’s modules. Now it’s time to review what you learned.